A recent blog entry at Waste360 has inspired me to return to my own blog, after several years of being quiet. The entry, titled "Banning Food Waste From Landfills is Noble, but Complex," is a frustrating view of waste management. It opens by saying "too often, it’s the government’s actions that cause problems for both the industry and the citizens it claims to be helping." And, "this move is unlikely to help anybody apart from attorneys." The purpose of environmental legislation is to protect the human and natural environment. For waste management, this has meant rules prohibiting ocean dumping and unlined pits. Modern landfills do a better job of protecting the environment because of those regulations, even though it has meant higher costs for landfill owner/operators. But government was needed to force that change to safeguard our water, air, soil, etc. Nobody is claiming that the recent organics disposal bans in MA, VT, CT are perfect or will be easy to implement/enforce. But that's not the heart of the attack -- it's that the law challenges the status quo of waste disposal, and potentially will take business away from landfill operators. That will only happen if the waste management industry is narrow-minded and opposed to change. The recycling and composting sectors of the waste industry have been progressive, pushing for better management of the resources in our "waste" stream. This includes better permitting for food waste composting facilities, feed-in tariffs to support anaerobic digestion, sophisticated material recycling facilities, etc. This generates more income for the "waste" industry, just not the "traditional" means of income. Look at landfill bans on yard trimmings, which created thousands of composting facilities around the country (some owned by the giants WM, Republic, etc. ), turning that material into a valuable commodity, and one that is beneficial for our soils and planet. Change is afoot, let's show the world that the American waste industry is ready to become the resource recovery industry. The Death of the SunChips Bag? As you may have heard, Frito-Lay (PepsiCo) announced this week that it will abandon its compostable packaging for SunChips, due to customer complaints about noise and poor sales. It will continue to offer the compostable bag for "original" SunChips, but reinstate conventional bags for the other flavors while it researches other options. This is extremely disheartening. Scrapping this innovative packaging solution because of the noise? I agree with Mother Jones that we are doomed as a species if we can't handle the loud sounds of an eco-friendly chip bag. Another complaint is that it doesn't compost fully in a backyard setting. Currently there is no certification for backyard composting in the U.S., but Frito-Lay hired Woods End Laboratory to show that sufficient temperatures could be reached in a backyard bin to successfully compost the SunChips bag. This process for developing the bag and testing home compostability demonstrates that Frio-Lay was intent on finding a true solution to its packaging waste, not just attempting to greenwash a product to boost sales. I personally think we should applaud these efforts, not attack them. While it's true that most of the U.S. does not have access to composting facilities that can process these SunChips bags (hence the home composting angle), there is also no infrastructure for recycling conventional chip bags either (multi-layer films are extremely difficult to recycle). Shouldn't we support this movement in the right direction? Seattle and San Francisco now require that foodservice packaging be either recyclable or compostable, and have mandatory composting for residences and businesses (San Francisco has mandatory source separation of recyclables and organics, whereas Seattle requires participation in its green cart program, unless notified that a resident is composting at home). And granted, there is customer confusion about how to recycle (and now compost) items, some of which has to do with problematic labeling. The Sustainable Packaging Coalition (SPC) has the Labeling For Recovery project, which addresses many of these issues. I hope that Frito-Lay does not give up on composting as a viable option for some of its traditionally non-recyclable packaging. And I hope that we can all see how properly managing our waste stream requires a cooperative vision: improved labeling of recyclables, more food waste composting infrastructure, clear communication about recycling and composting, local government commitment to organics diversion and higher recycling rates, and product redesign to promote reduction, reuse, and recycling/composting. Food waste composting programs are taking off in Ohio, as the infrastructure to processes those organics rapidly expands. This is much to the credit of the Ohio EPA, which works closely with businesses looking to divert food waste, and helps composting facilities with permitting. 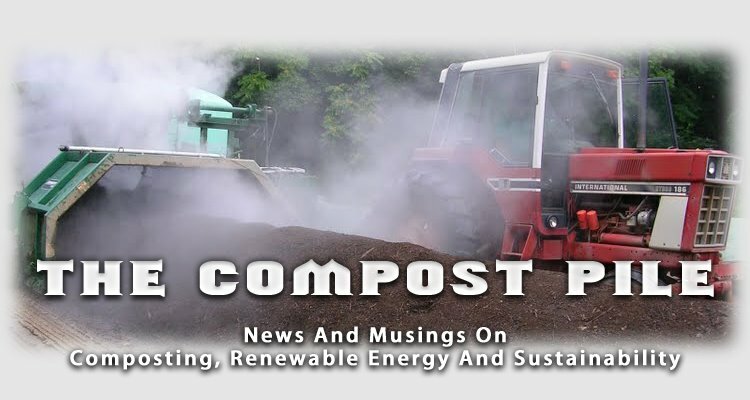 Do you love compost, and want everybody to know about it? Then check out these new buttons! One of my new projects is RRcraft, where we combine art with environmentalism, with green themes and greeting cards printed on 100% recycled paper with soy inks. The concept for this button is a family story. When I started writing for BioCycle magazine, my grandmother was very excited. She has long been an avid composter, and recalled a story from many years ago, when she was profoundly critical of the state of affairs in the world (somewhat similar to today). My grandfather asked her, "Well Natalie, do you believe in anything?" She quickly responded, "Yes, I believe in COMPOST!" My grandmother is still composting, even though space is limited at her retirement home, and she uses a walker to get around. She has a small balcony, and puts her food scraps in a large planter, using a big kitchen spoon to stir the compost. The spoon is sterling silver, so those food scraps get the royal treatment!